The RV Golfer checks out custom carts and buys himself a shiny new set of wheels. As golfers age, there seems to be a natural progression as to how they get around a golf course. They go from walking and carrying a bag in their twenties to using a push cart in their forties and a power cart in their sixties. Power carts have many advantages, including extending the golf season with cart-paths-only play and speeding up the pace of play, something both golfers and course managers want. Using a power cart also makes the game more enjoyable because it is physically less demanding. Power carts are found on most golf courses because they’re a good source of revenue. There is even a close correlation between use of power carts and increased beer sales. In Canada, almost all public courses have power carts for rent and bringing your own cart is only allowed for special reasons. 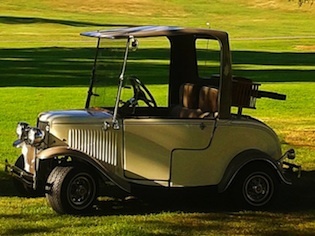 Two American companies dominate the Canadian golf cart market: Club Car and EZ-Go. Both companies are out of Augusta, Georgia. Each claims to have the most reliable, durable and best-engineered power carts in the world, gas or electric. Other cart manufacturers are Yamaha and Global Electric Motorcars (GEM). GEM is a Canadian company and makes very fashionable electric carts that can be customized to fit the owner. After looking at different models, my choice was an electric Club Car, the Precedent i2. This cart was introduced in 2004 and has dominated the market. 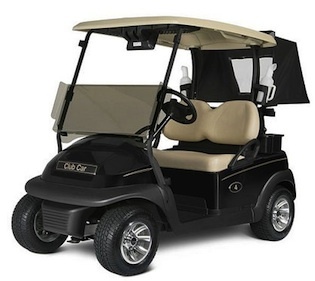 Club Car is the world’s largest manufacturer of small-wheel, zero-emissions electric vehicles. The cart has many features, including durability, a smooth ride, superior handling and plenty of power. The standard engine includes a Kawasaki FE 350 13-horsepower engine producing 19 to 25 miles per hour. There are six batteries with the Excel Electrical System, delivering 48 volts. A battery charger is included in a basic package. The frame is a rustproof AlumiCore with a rack and pinion Sport Drive steering and suspension system combined with self-adjusting rear brakes. The ride is smooth because of the hydraulic shocks, especially if the cart is equipped with larger wheels. Other features include a monsoon canopy roof for draining water, club protection canopy, split windshield, cockpit interior, large basket, deep bag well, winter guard covering, single point watering battery system and a wraparound 360-degree bumper. The Precedent i2 Signature Edition comes in eight basic colors. Accessories can add a personal touch: you can choose a burlwood dash, a tinted windshield, accent stripe colors, a water mister for summer, a heater for winter, club and ball washers or sand bucket holders. The price for a Precedent i2 is in the US $7,000 range, but add accessories and the price tag could reach double figures. 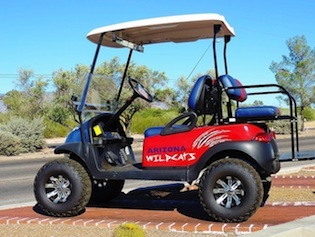 In Arizona customized power carts are popular because they can be made street legal. Street legal means the golf cart can be used on public roads if driven under 35 miles per hour. These carts must be registered with the DMV and the driver must have a valid driver’s license and liability insurance. Just like any car on the road, carts must have taillights, headlights, a rear view mirror, signal lights, horn, seat belts and windshield wipers. Popular accessories include a stereo, GPS, reflectors, battery indicator, reverse beep, lockable glove box and padded steering wheel. A custom paint job is an individual choice, and cart owners favour everything from their favorite football team to their company logo. 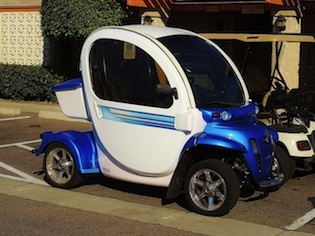 In Arizona, power golf carts are called cars, not carts. 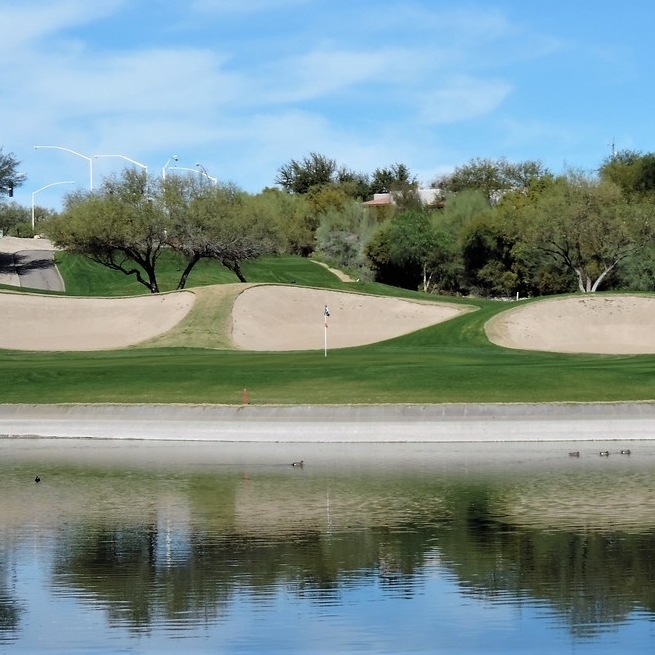 When I talked to Terry Hill, operations manager at Golf Cars of Arizona, he pointed out that carts are pulled or pushed, but cars are driven. 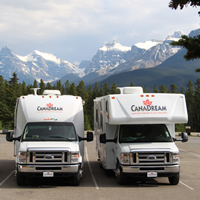 For the purpose of this article, however, I’ll use the Canadians term carts. Power carts come in all shapes and sizes. It’s possible to create a cart that resembles an antique Ford or even the Batmobile. Pro golfer Bubba Watson made a commercial with a hovercraft golf cart. Custom Cars of Arizona has six outlets in Southern Arizona and deals in new, used, reconditioned, solar, rental and customized carts. If you live in British Columbia, check out the website of S.C. Carts in Vernon. 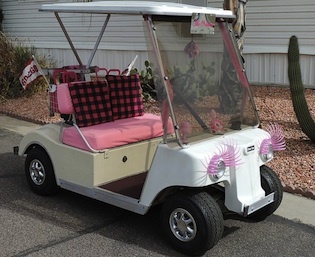 In Calgary, Koolsville Kustoms is the leading customized golf cart manufacturer. 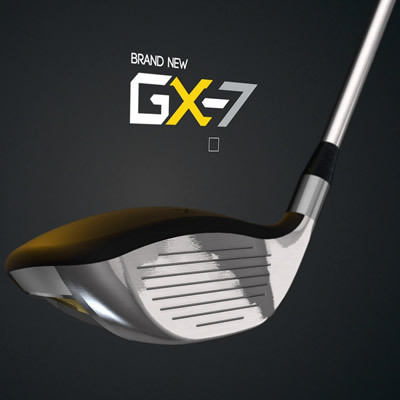 Appealing TV advertising can entice you into buying golf products that may not be an improvement over your current clubs.